Men's Twin Profile Wedding Ring : LOVE2HAVE in the UK! 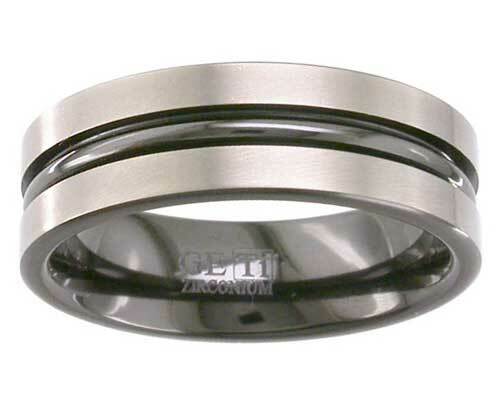 A men's twin profile wedding ring. One of our more unusual twin finish wedding rings, this particular wedding ring not only features twin finishing but twin profiling too! Here we have a 7mm width, flat profile zirconium ring with a centre rail shown here in a satin finish with a polished black rail. The shiny black rail comes in a rounded profile and goes all the way around the ring, and it has been machine engineered to catch the light. So not only is there a stark contrast between the black and the grey surface but also a striking difference in the rounded a flat surface. Additionally, the inside surface comes in all black too.